Even I know if a=b and b=c, then a=c. My wife, the Mathlete, however informed me that it is called: the Transitive Property of Equality. I love Brittany and her math-brain! She was telling me how by applying I Cor. 13:4-8 to the Transitive Property, we can learn about the character of God. Anyone who’s ever been to a wedding is familar with 1 Cor. 13:4-8. It is the whole “love is patient, love is kind” spiel that softens even the most stubborn of hearts. John tells us in 1 John 4:8, that GOD IS LOVE. 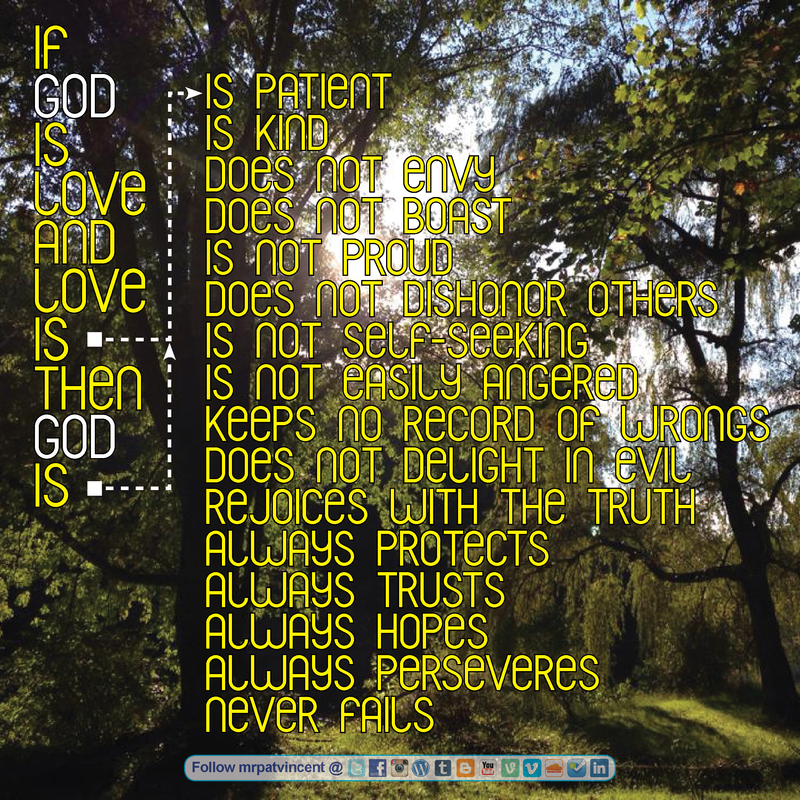 Therefore, we can insert God for “love” in 1 Cor. 13 and get a closer insight into who God is. God is patient. God is kind. God does not envy, He does not boast, He is not proud. God does not dishonor others, He is not self-seeking, He is not easily angered, He keeps no record of wrongs. God does not delight in evil but rejoices with the truth. God always protects, always trusts, always hopes, always perseveres. God never fails. Take a minute in your busy schedule today to meditate on this and to thank God for all His astounding attributes! God bless! *Thanks to Brittany for my math lesson for the day. **Thanks to Jessica Sell for the pic. This entry was posted in Christian and tagged Brittany, Christ, First Epistle of John, First Epistle to the Corinthians, God, Holy Spirit, Jesus, Jesus Christ, John, liveforJesus, Religion and Spirituality. Bookmark the permalink.